"Whether you're a dedicated gardener or a newcomer to the word of growing, take a look: Charles's methods work beautifully." "If this doesn't encourage more of us to turn our gardens into productive and beautiful spaces, I don't know what will." 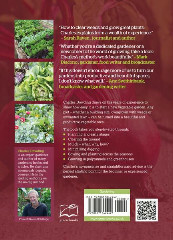 "How to Create a New Vegetable Garden is the best vegetable gardening book I have read for a long time." "Another inspiring yet practical book from Charles Dowding." "It is impossible not to geel inspired by the unique combination of helpful guidance and enthusiastic encouragement of experimentation. As Charles proves, there is no plot of land too wild to tame, a building site too overgrown with weeds or an unwanted lawn that can't be turned into a productive and beautiful garden area." "This is yet another book that will, as a manual, be on my bookshelf, but it will sure spend more in my hand than on the shelf." "How to clear weeds and grow great plants: Charles explains from a wealth of experience."